Scroll down the page for more Treats! Lots more pictures on my Facebook page! 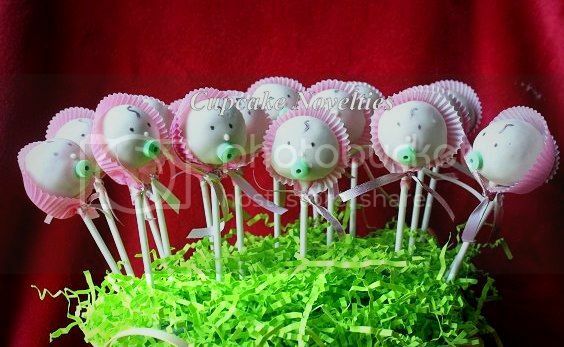 Baby Shower Cake Pops - Babies in Bonnets! 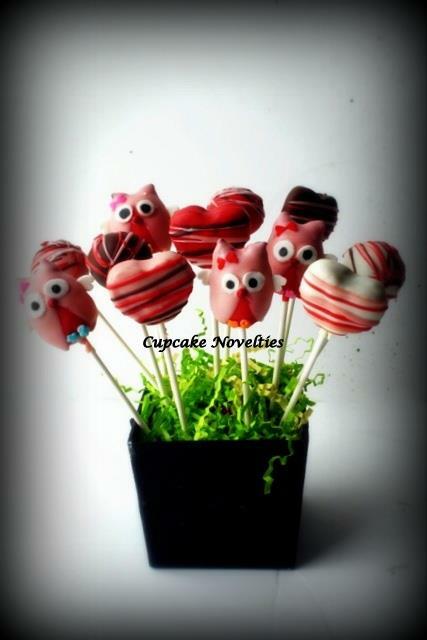 Valentine's Hearts & Owls Cake Pops! 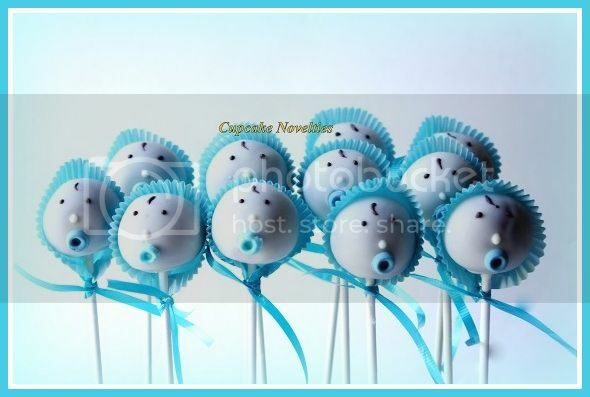 Dallas Cowboys Cake Pops - Footballs & Helmets - can be done for any sports teams! 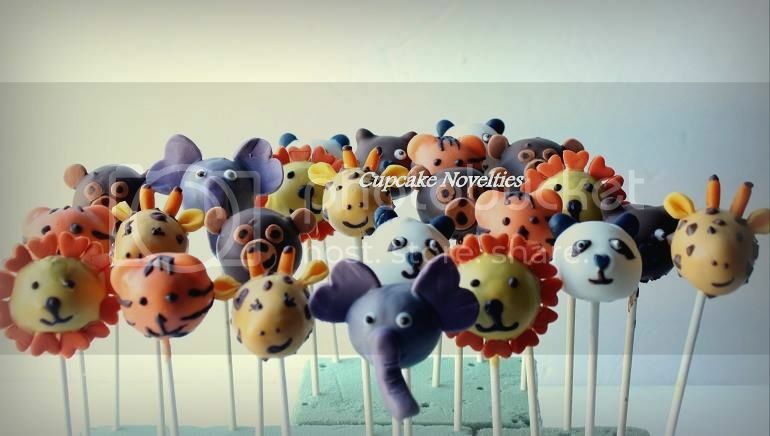 Jungle Animals Cake Pops including Lions, Tigers, Elephants, Giraffes, Monkeys, Bears & Pandas! Ladybug Cake Pops for a Ladybug Birthday Party! Easter Cake Pops Gift Boxes!! Cake Truffles and Cake Pops are bite-sized balls of moist cake enrobed in rich chocolate and decorated to match your party theme and colors. We also specialize in making Cake Truffle "Wedding Cakes" and "Towers" that you can display as large centerpieces or small centerpieces for each table. Please choose flavors from our Flavors and Frostings page or feel free to suggest your own and we can work something out! Check out more pictures of our work at www.facebook.com/cupcakenovelties. Cake Truffles and Cake Pops are priced at $26 per dozen +tax. You can choose your colors and sprinkles or colored drizzle on these. Intricate decoration, shaped cake pops (yes, we can make soccer balls, apples, owls, bees, and more!) 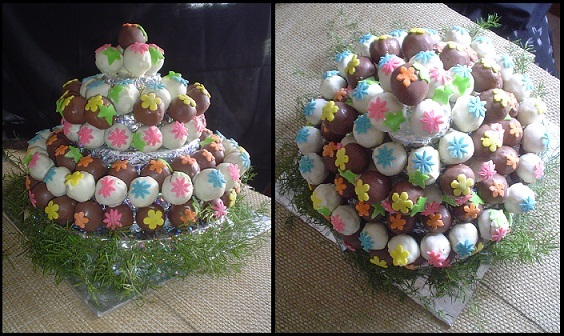 and fondant embellished cake truffles and cake pops start from $28 per dozen +tax. 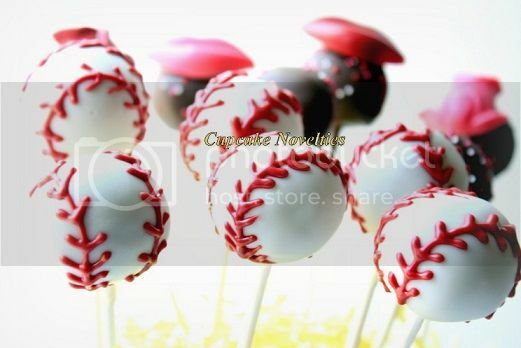 For edible images on cake truffles and cake pops, add $20 per dozen. Cake Truffle Tower Centerpieces/Wedding Cakes are customizable for any event and include the display set up and themed decoration to match your occasion. 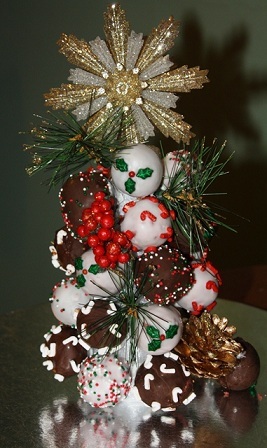 Our unique Cake Pop Wreaths and Cake Pop Christmas Trees make beautiful centerpieces and double up as dessert too! Farm Animals Cake Pops for a birthday at Frying Pan Farm Park in Herndon! A Pie Wedding! Delicious Made from scratch Pies in gourmet Apple & Cherry flavors, with a cutting cake for the bride and groom! Great for a Rustic Fall Wedding!! 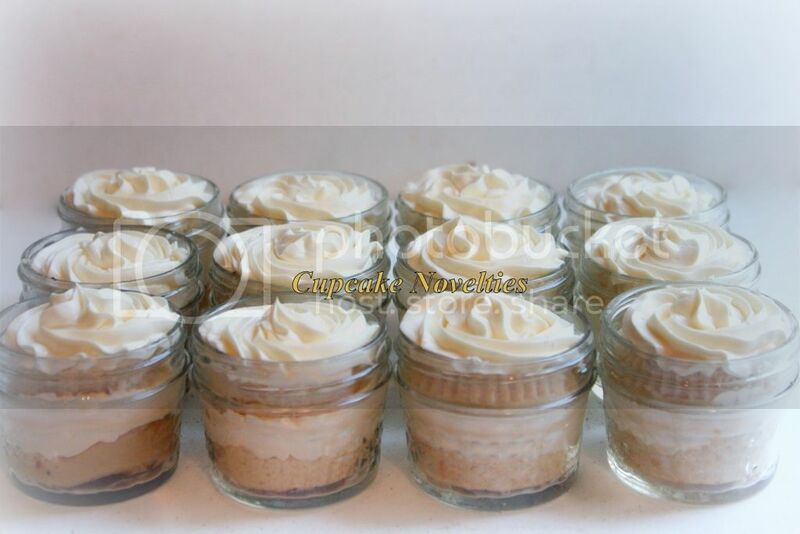 Pies baked in Jars for a sweet Holiday gift! 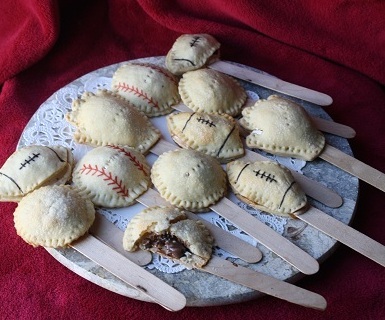 Delicious, light, flaky and buttery Pie Pops with a variety of fillings to choose from! 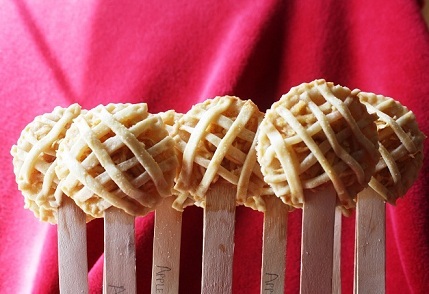 These pies on a stick are convenient to eat and serve. Shapes available include round, square, diamond, star, flower blossom, heart, football and more! Custom shapes available too - just ask! Fillings include Apple, Dutch Apple Crumble, Cherry, Pumpkin, Lemon, Chocolate, Raspberry, Strawberry, Nutella, Pecan, Blueberry and Peach. Please let us know if you are looking for a filling that is not listed above. Delicious gourmet caramel & chocolate-dipped apples (we use fresh Organic apples) available with your choice of toppings! Perfect for gifting, Fall wedding favors, or any occasion! Choose from crushed peanuts, crushed salted pretzels, crushed Oreos, marshmallows, a wide variety of sprinkles, drizzle of colored chocolate (to go with the theme of your event/wedding/party), or simply get them plain, dipped in smooth homemade caramel and/or chocolate! Custom designs (Minnie Mouse-inspired pictured below) can be done as well! Price starts from $7 each (plain) and $8.50 each (dipped in caramel, chocolate & toppings). Custom designs are charged based on the design/decoration chosen. Contact Us for more info! 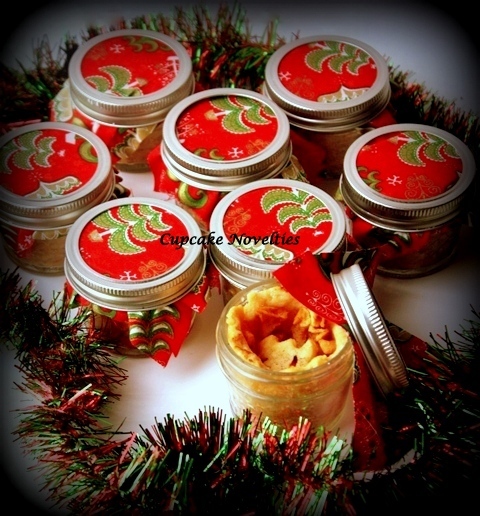 Our yummy Cupcake in a Jar comes in a variety of flavor combinations, tied with a ribbon and spoon, ready to eat or gift! Makes a great party favor or thank you gift! Have a look at the menu to make up your own custom combination for delicious and convenient Cupcakes in a Jar! 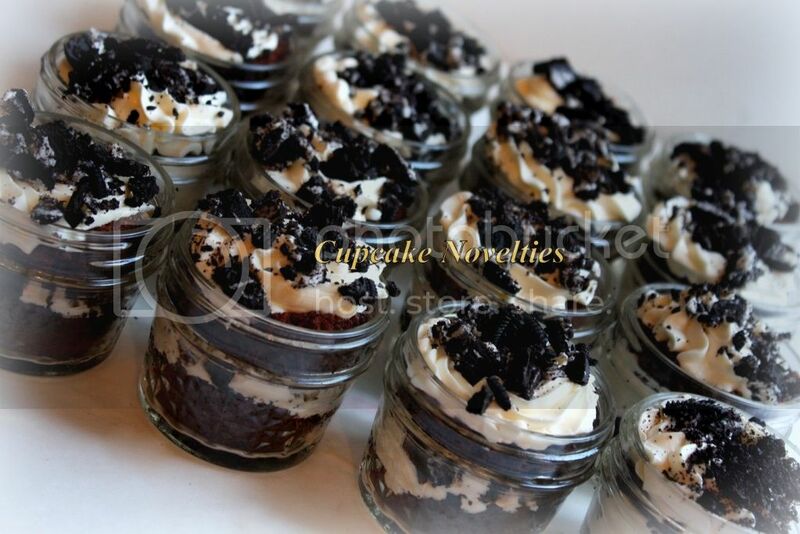 Cupcakes in a Jar can be stored for a longer period of time - great to satisfy that sudden craving for yummy dessert!! Tea Party Cupcake Favors for a Bridal Shower Tea Party with a handmade edible teapot & teacup on a 'quilted tablecloth'! Perfect for individual servings, goody bags and easy to carry, Cupcake Pods contain one cupcake with a giant swirl of yummy frosting and a spoon to enjoy the goodness of moist cake! Choose your favorite flavor and frosting from our menu and select customization according to your party theme. 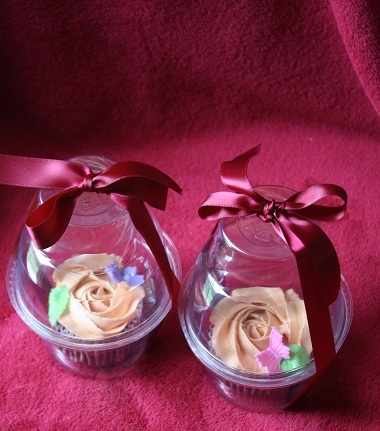 Cupcake Pods cost $4 each and include a decorative ribbon (tags added on request for a nominal fee). Choose any flavor from our menu. * Add filling for $0.25 each. * Add edible images for $12 per dozen. Snickers: Chocolate cake with Caramel filling and frosting sprinkled with crushed Snickers candy. Coconut: White Cake topped with toasted Coconut and dark chocolate chips with coconut frosting. Dipped Strawberry Shortcake: White Cake with strawberry filling and frosting topped with white chocolate curls. Black & White: Rich chocolate cake with chocolate frosting topped with chocolate chips. Boston Creme: Chocolate Cake with vanilla custard filling and chocolate ganache topped with white chocolate drizzle. Cupcake Kabobs are unique treats that look like kabobs but are made of frosted mini cupcakes, marshmallows, wafers, strawberries or rice krispie treats threaded on skewers! Eat them as is or choose one of our dipping sauces to go along with your Cupcake Kabobs. Serve Cupcake Kabobs as part of a centerpiece or ask us to wrap each skewer for you to hand out to your guests at a party. 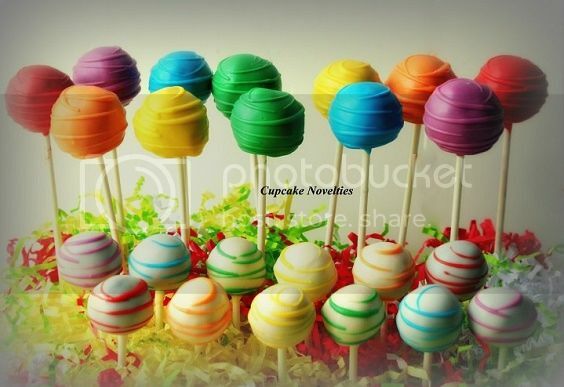 Each skewer contains 2 frosted mini cupcakes and your choice of 4 thread-in combinations. Choose from strawberries, marshmallows, rice krispie treats and wafers. Suggest your own thread-ins and we can see if it works! Cupcake Kabobs costs $4.50 each. We make our own dipping sauces and sell them in 2 oz. containers. Each 2 oz. container of dipping sauce costs $1.50 each. Dipping sauce flavors include vanilla, chocolate, strawberry and peanut butter. Cake Push Pops ordered as birthday party favors! Layers of vanilla cake, vanilla buttercream & rainbow sprinkles! Halloween-themed Cake Push Pops! Great for school treats, Halloween trick-or-treaters, party favors or just because!! Delicious layers of cake and frosting in easy to serve push pop containers! Can be customized to any flavors and colors. 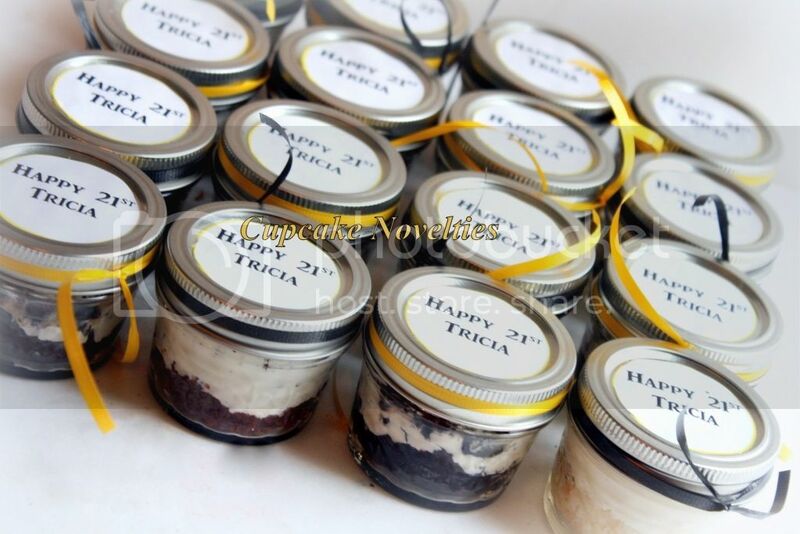 Great to serve at birthdays, parties or to give out as favors or in goody bags. Priced at $3.50 each with a minimum order of 6. Hand-dipped and Soft serve Ice Cream Cupcake Cones! Can be made in any flavor and color. Great for birthdays and summer parties! Priced at $3.25 each with a minimum order of a dozen.